We asked food connoisseurs Denver Britto and Kimberly D’Souza from the award-winning blog WhereMyFoodAt the best fries they’ve had till date (and mind you they’ve been to countless restaurants globally and indulged in an insane variety of fries) 🍟. WMFA has won the ‘Best Food Blogger’ title by Ahlan!, BBC Middle East, Stylista, etc 🏆 and they’ve been kind enough to consolidate a list for us, of the best fries they’ve had in the UAE, and I guarantee you these pictures will have you drooling by the time you reach the end! 😍 Please note, the below is not in ranking order. Not only do they have some of the best burgers and sliders in Dubai but their selection of sides are as unique as the rest of the menu. 🍔🍟 Love the textual element aided by the crunchy bacon and the drizzle of spicy sauce that adds a nice heat to the entire dish. Boca Potato Chips (Dhs40) that aren’t like any other potato chips we’ve had in terms of presentation, texture and flavor 🍟❤ The aioli and truffle mayo complimented the chips beautifully as well! 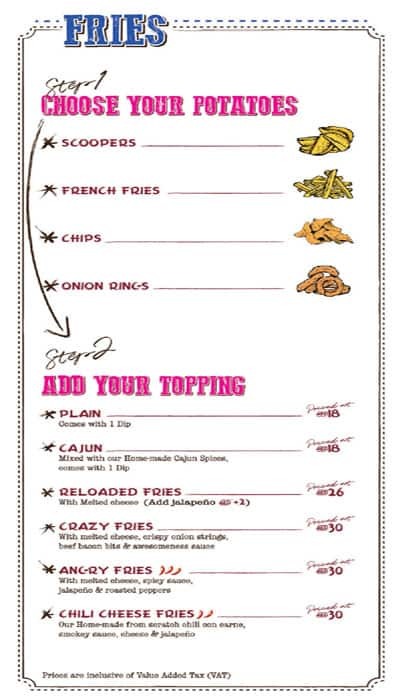 For a roundup of some of Dubai’s best truffle fries, click here. Are we missing out on any of your favorites? Do let us know in the comments below!